Hallwalls is pleased to present a rare and extraordinary artist residency project with internationally-renowned American master of sound and form, trumpet player/composer/improviser Wadada Leo Smith and his Golden Quartet. The Golden Quartet features three master musicians in their own right; bassist John Lindberg, drummer Pheeroan akLaff and pianist Angelica Sanchez. They will be joined by a long-active Buffalo-based ensemble featuring percussionist John Bacon, cellist Jonathan Golove, saxophonist Steve Baczkowski and Mexican guitarist Omar Tamez. The two quartets will collaborate on a performance of music selections from Mr. Smith's master work Ten Freedom Summers, a tribute to the American Civil Rights Movement. Mr. Smith will also conduct a workshop with students from Buffalo Academy for Visual & Performing Arts. 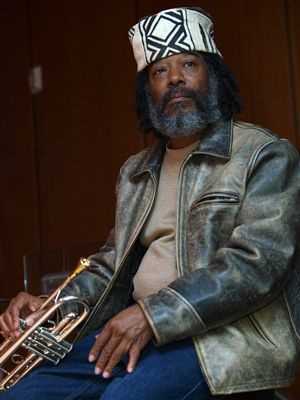 Wadada Leo Smith – Biography: trumpeter and multi-instrumentalist, composer and improviser has been active in creative contemporary music for over forty years. His systemic music language Ankhrasmation is significant in his development as an artist and educator. Born in Leland, Mississippi in 1941, Smith's early musical life began in the high school concert and marching bands. At the age of thirteen, he became involved with the Delta Blues and Improvisation music traditions. He received his formal musical education with his stepfather Alex Wallace, the U.S. Military band program (1963), Sherwood School of Music (1967-69), and Wesleyan University (1975-76). Mr. Smith has studied a variety of music cultures: African, Japanese, Indonesian, European and American. He has taught at the University of New Haven (1975-'76), the Creative Music Studio in Woodstock, NY (1975-'78), and Bard College (1987-'93). 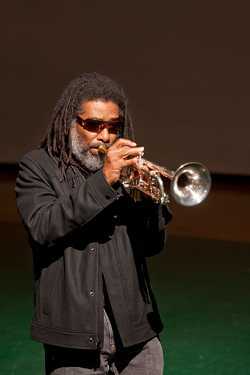 He is currently a faculty member at The Herb Alpert School of Music at California Institute of the Arts. He is the director of the African- American Improvisational Music program, and is a member of ASCAP, Chamber Music America, and the Association for the Advancement of Creative Musicians. Mr. Smith's awards and commissions include: Fellow of the John Simon Guggenheim Memorial Foundation (2009-2010), Other Minds residency and "Taif", a string quartet commission (2008), Fellow of the Jurassic Foundation (2008), FONT (Festival of New Trumpet) Award of Recognition (2008), Jazz Journalists Association Jazz Award (2005), Islamic World Arts Initiative of Arts International (2004), Fellow of the Civitela Foundation (2003), Fellow at the Atlantic Center for the Arts (2001), "Third Culture Copenhagen" in Denmark-presented a paper on Ankhrasmation (1996), Meet the Composer/Lila Wallace-Reader's Digest Commissioning Program (1996), Asian Cultural Council Grantee to Japan (June-August 1993), Meet the Composer/Lila Wallace-Reader's Digest Commissioning Program (1990), New York Foundation on the Arts Fellowship in Music (1990), Numerous Meet the Composer Grants (since 1977), and National Endowment for the Arts Music Grants (1972, 1974, 1981). Mr. Smith's music philosophy notes (8 pieces) source a new world music: creative music has been published by Kiom Press (1973), translated and published in Japan by Zen-On Music Company Ltd. (1976). In 1981 notes… was translated into Italian and published by Nistri-Litschi Editori. Some of the artists Mr. Smith has performed with are : Muhal Richard Abrams, Anthony Braxton, Leroy Jenkins, Roscoe Mitchell, Lester Bowie, Richard Teitelbaum, Joseph Jarman, George Lewis, Cecil Taylor, Andrew Cyrille, Oliver Lake, Anthony Davis, Carla Bley, David Murray, Don Cherry, Jeanne Lee, Milton Campbell, Henry Brant, Richard Davis, Tadao Sawai, Ed Blackwell, Sabu Toyozumi, Peter Kowald, Kazuko Shiraishi, Han Bennink, Misha Mengelberg, Marion Brown, Kazutoki Umezu, Kosei Yamamoto, Charlie Haden, Kang Tae Hwan, Kim Dae Hwan, Tom Buckner, Malachi Favors Magoustous and Jack DeJohnette among many others. Mr. Smith currently has three ensembles: Golden Quartet, Silver Orchestra, and Organic. His compositions have also been performed by other contemporary music ensembles: AACM Orchestra, Kronos Quartet, Da Capo Chamber Player, New Century Players, San Francisco Contemporary Music Players, Contemporary Chamber Players (University of Chicago), S.E.M. Ensemble, Southwest Chamber Music, Del Sol String Quartet, New York New Music Ensemble, ne(x)tworks, and California E.A.R. Unit. Mr. Smith's music for multi-ensembles has been performed since 1969. "Tabligh" for double ensemble was performed by Golden Quartet and Classical Persian ensemble at Merkin Concert Hall (2006) and by Golden Quartet and Suleyman Erguner's Classical Turkish ensemble at Akbank Music Festival in Istanbul (2007). His largest work "Odwira" for 12 multi-ensembles (52 instrumentalists) was performed at California Institute of the Arts (March 1995). His Noh piece "Heart Reflections" was performed in Merkin Concert Hall, NY (November 1996). Golden Quartet is an ensemble of master composers / performers, whose experimental practice utilizes the quartet form, which is the purest foundation of musical expression in jazz / creative music and western music culture. As multi-instrumentalists they are concerned with a practice and research that involves an array of complex systemic forms, where the musical languages of compositional / improvisational / ankhrasmation are merged seamlessly in their interactive development in the quartet and are manifested in the performance dimension as a single music language. Golden Quartet's music is fiery, explosive, and surges with a positive improvised energy force that's constructed with polycentric melodic / sonic / rhythm units. The ensemble's textural and structural materials reveal a musical terrain that is creatively rich and architecturally clear in form. This week-long residency and public performance by Wadada Leo Smith & the Golden Quartet & Double Quartet are made possible with a major grant from the Jazz Presenting program of Chamber Music America (CMA), a grant for jazz programming from the Doris Duke Charitable Foundation, and public funds from the Music program of the New York State Council on the Arts (NYSCA), a state agency & generous support from Robert D. Bielecki (www.fastorbit.com).